Established 1996. Owned and operated by Brett Corbett and Brad Minors, both Master 5 mariners. Our decks are run by fully licenced contract deckhands. Your safety (and ours) are paramount . Our local knowledge and experience deliver fish with safety. In the past 20 years 17 other operators have come and gone,we are still here. We offer value for money while still delivering the best fishing charter service available. We work 7 days a week from Swansea and service Newcastle, Lake Macquarie and the Central Coast. 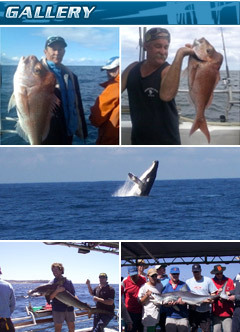 Our deep sea fishing charters cater for large and small groups, single anglers and couples. We have Bucks Party specials and discounts.We offer whale watching cruises (in season). Social club competitions, contract boat hire,etc . Before you look any further check out our specials for singles, small groups, large groups, bucks parties and super mid-week group specials. B & L Fishing Charters & Cruises also have great Whale Watching Tours. Feel like seeing one of Nature's wonders? B & L Fishing Charters & Cruises have fantastic Eco Tours of the famous Lake Macquarie. Find out about the great lake, so why not relax and learn at the same time.